Why Not ! Your search for high end performance at an economical price is over! Hikari-USA is proud to introduce their Etaro line View Etaro collection.. That’s right! After many years of extensive research, innovation, and testing, Hikari Products USA, Inc. (HPI) is taking the unprecedented step of introducing an entirely new line of scissors. These new scissors provide the coveted Hikari performance at an amazing price! What are you waiting for ! 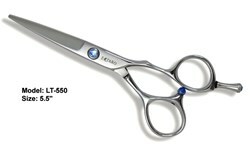 Get your Etaro #hairdressing scissors today Order now!